Guangzhou (Jan. 6, 2014) – The Wildlife Conservation Society applauds China’s State Forestry Administration and the General Administration of Customs for destroying six tons of ivory and other illegal wildlife products – a major development in the effort to protect elephants from the ravages of ivory poaching. Raw and carved ivory on display moments before the crush ceremony. The wildlife products, which included tiger and leopard skins, were destroyed on January 6th, 2014 at the Huangpu Customs in Guangzhou. The event comes in the wake of an increased coverage of wildlife crimes on nation-wide mainstream media outlets during the past year, latest being a front-page feature story about international ivory trafficking last November. The story, titled “Blood Ivory” appeared in the November 15th paper and online editions of Southern Weekly one of China’s most influential newspapers with a longstanding reputation for investigative journalism. The story highlighted the links between ivory trafficking and terrorist organizations threatening local governance in crucial areas for China’s overseas strategy. Furthermore, the cross-cutting analysis of this article promoted a new perspective on wildlife crime, which is now featured mostly on finance-related pages on China’s largest web portals instead of being limited to the environmental news section. Throughout Africa, elephant numbers have plummeted by 76 percent since 1980 due largely to the demand of elephant ivory, with an estimated 35,000 slaughtered by poachers in 2012 alone. With this decision the Chinese authorities have taken a strong and unprecedented stance against ivory trade and consumption. By burning these six tons of ivory, China’s leadership has decided to bet on elephants’ survival and stand apart from those still considering ivory a “white gold” worth stocking as a long term investment. During the past year China has recognized wildlife resources depletion as a major environmental concern for the country. 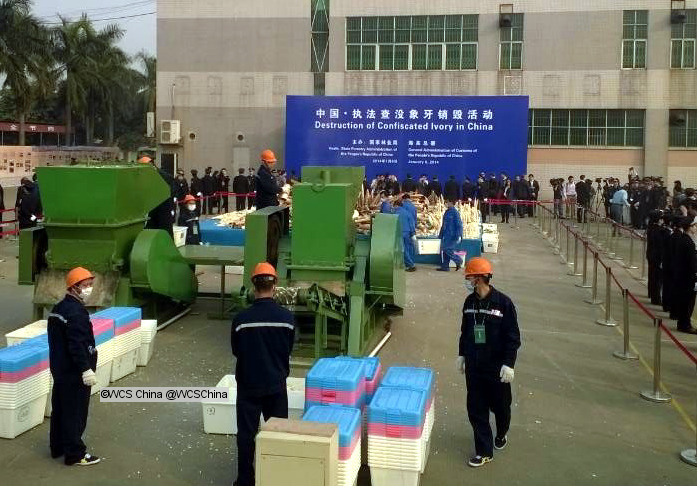 WCS believes that today’s event marks an important milestone and China authorities will further expand the country’s commitment to national and international law enforcement operations against wildlife crime. In December authorities in Jilin Province completed the province’s ever largest operation against poachers. The arrests were made by the Forestry Police of the Hunchun Municipal Forestry Bureau (HMFB), a member of the Law Enforcement Cooperation Framework (LECF) initiated by WCS in 2011. With WCS help, HMFB has been conducting SMART (Spatial Monitoring and Reporting Tool) patrols and snare removal campaigns, as well as camera trapping in the rural areas outside of Hunchun National Nature Reserve (HNR) since January 2013. Seven months later, the intelligence gathered convinced HMFB to establish a special Wildlife Conservation Section in order to strengthen anti-poaching and wildlife conservation operations. Through its presence in 64 countries, WCS is leading global efforts to save Africa's elephants and end the current poaching and ivory trafficking crisis by stopping the killing, curbing the trafficking, and reducing the demand. In Africa, WCS is stopping the killing on the ground by recruiting, equipping and training park guards, and providing them with aerial and intelligence support. 13 of Central and Eastern Africa's most populated and threatened parks benefit from these initiatives, from Nouabalé-Ndoki in Congo to Ruaha in Tanzania and Niassa in Mozambique. In Asia and Africa WCS intensively fights the trafficking along the most important ivory trade routes. In China and Vietnam WCS provides regular capacity trainings on the latest wildlife crime investigation techniques to thousands law enforcement officers every year. Through an extensive market surveillance network WCS collects crucial intelligence for uncovering trade networks and initiating law enforcement operations at every step, from the source habitats in Gabon and Tanzania to the consumption points in Vietnam and China. Globally, WCS is working to stop consumer's demand for ivory, which drives the killing and trafficking. Strategic partnerships with mainstream and new media outlets enable us to educate citizens of consumption countries such as China and Vietnam about the bloodshed ivory most often originates from. Through social media platforms we stimulate the debate over ivory and wildlife consumption both in China and internationally. In the US, WCS seeks national and state moratoria on ivory sales, and last September launched its 96 Elephants campaign to amplify and support the Clinton Global Initiative (CGI) for Africa’s elephants. The WCS campaign focuses on: advocating effective U.S. moratorium laws; bolstering elephant protection with additional funding; and educating the public about the link between ivory consumption and the elephant poaching crisis. A moment of the ivory crushing operations.